It’s no secret that game streaming is huge business these days, with tons of streamers trying to set themselves apart from the competition to show off their talents and build their audiences. One great way to do that is with a dual PC streaming set up – essentially using two separate PCs, one for gaming and the other for broadcasting. The process to configure this type of setup can be a little tricky, so we’ve put together this handy guide in conjunction with Khaljiit, one of the hottest streamers going these days, to make it simple. Gaming alone can stress even high end PC hardware, so adding streaming to the mix and all the running programs that can entail on one system can be especially taxing, unless of course you’re working with a serious multi-core system. The end result can be a laggy gaming experience that doesn’t reflect well on your true abilities. To solve this, many of the top streamers like Khaljiit are beginning to use a second PC to broadcast their stream, runs OBS, their bots, etc, leaving the first PC to focus solely on producing those eye-popping frame rates that gamers love. Oftentimes, this is easier/more cost effective than replacing your current PC with new, more extreme hardware. It’s also super cool. The easiest way to configure a dual PC streaming set up is by using a capture card to capture the gaming output (both video and audio) and pass that onto the streaming system to send off to Twitch. 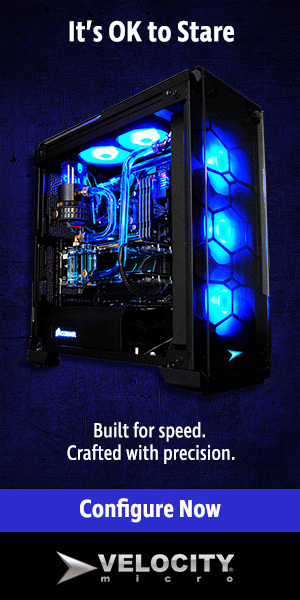 This essentially treats the gaming PC like a console dedicated just to your game. You’ll want the PC with the more powerful CPU to act as the streaming system and the one with the more powerful GPU to run your games. The diagram below should help. Two PCs, one more GPU intensive (gaming) and the other more CPU intensive (streaming). Our team can assist with configuring two systems that will be optimized for your needs and budget, but our Raptor Z55 is an excellent starting point. Two monitors (or more) since you’ll need at least one display for each PC. Capture card – This is the hardware that “captures” the info from your gaming system. We like the El Gato HD60 Pro as an internal solution. This goes in the streaming box. You can buy that here from Amazon. To correctly configure your two PCs for streaming, there is some work to do coordinating displays, mics, audio, etc. Twitch has put together a detailed step by step guide for this process, that’s applicable to our PCs as well, so rather than replicate that, we’ll simply link to it here. And now you should be up and running, ready to conquer the streaming landscape just like Khaljiit. Questions? Give us a call at 804-419-0900 – we’re here to help.